Who Should Buy GRAFT Tokens? So who should consider getting GRAFT tokens and why? Merchant token is a simple smart contract that allows creating a private token that belongs to its owner. Unlike some other smart contract and token platforms, creation of GRAFT merchant token does not require any programming and can be done by anyone. The business features described below are typically associated with using complex third party service providers and high implementation costs, which makes those services inaccessible for small to medium size businesses and expensive to large businesses. GRAFT Merchant tokens allow any merchant to implement those important business features with minimum efforts and low cost. Store Credits are typically utilized by merchants for performing purchase returns and exchanges, when return cannot be done using the original payment method, or the merchant’s return policy does not allow the full refund. Store Credit essentially transforms return to exchange, so the merchant does not lose the customer and associated revenue. Store Credit Token can be linked to the item price in local fiat currency, so the customer can use those tokens during next purchase “instead” of or in addition to the payment with local fiat currency. Store Credit tokens usually either do not expire or have very distant expiration date as they are basically replace the fiat currency. Loyalty Rewards is powerful marketing instrument which attracts customers and increases spending. Loyalty Rewards can be awarded with each purchase, or as one-time bonus, or using other models. The rewards than can be used to makes purchases of particular items or all items, or converted to cash. Loyalty Rewards are not necessarily linked directly to fiat or crypto currency as they can be spend to provide discount or buy a special “unique” reward items that are not available for sale using other methods of payment. Loyalty Rewards usually have relatively close expiration date. This way the merchant “stimulates” earning more rewards and eliminates accumulation of very large amounts of reward points that can become useless. Gift Certificates can be issued by merchant in order to attract customers. In order to increase the effect, gift certificates can be sold with discount (for less than their nominal price). Gift Certificate tokens usually either do not expire or have very distant expiration date as they are basically represent the fiat currency. Discount coupons can be used for one-time or long term promotions. The coupons can be distributed publicly or to individuals, in wallet or paper form. The coupon then can be scanned by point of sale in order to get discounted or even free item. Creating new merchant token (“smart contract”). Can be done using point of sale app. Renew merchant token (“smart contract”). Can be done using point of sale app. Add more merchant tokens to the circulation. Merchant’s point of sale sends merchant tokens to the customer wallet or prints a paper wallet. Customer redeems merchant tokens at merchant’s point of sale using wallet app or paper wallet. All the merchant token fees are paid to the current supernode authorization sample. Merchant always pays the token transaction fee, which means the buyer never pays the fee. A regular transaction fee is applied to each transaction with merchant token, including adding, issuing, and redemption. As GRAFT fees are proportional to transaction amount, the fee is calculated based on 1 token = 1 GRF, although it’s not necessarily that the token has any direct link to the GRF or other currency. It’s important to note that GRAFT fees are calculated based on logarithmical formula so there is no danger of paying high fee on large amounts. The initial Create transaction implies a special higher fee because it is associated with naming a token. In order to prevent “domain squatting”, the initial fee is set to a reasonable amount that prevents massive abuse. Initialization fee of 5 GRF is required to generate a new merchant token smart contract (Create transaction). The renewal fee is 10 GRF. VChain allows creating a virtual chain of stores so multiple point of sales can be “connected’ to the same private “virtual blockchain”. Thus, there is a dual meaning of word “Vchain”: virtual chain and virtual blockchain. Vchain creates a private common platform for managing merchant tokens and items catalogue. Merchants can create their own private vchain which is going to be accessible only by this particular merchant and contain all information about its tokens. Vchain allows connecting multiple points of sale or even creating a chain of multiple stores. Points of sale that belong to the same vchain can issue and accept the same merchant tokens, use the same shared item catalog stored and maintained on the blockchain, generate aggregated transaction reports, and more. Buyers can use vchain to link multiple wallets so they can manage multiple accounts and move funds between those accounts without paying fees. This feature is useful for family and corporate accounts. There is initialization annual fee of 5 GRF for creating a new Vchain smart contract. The renewal fee is 10 GRF. Those fees are required to securely process the smart contract and prevent system abuse. There is a separate annual fee of 10 GRF for adding another point of sale or wallet to the vchain. All vchain fees are paid to the current supernode authorization sample. Our main goal is making the cryptocurrencies as convenient as plastic cards, while keeping the payment secure and private. We do this on both sides of the transaction: the buyer and the seller (merchant). In order to achieve those goals, we need a smooth transition from traditional payment methods, such as credit cards, to more progressive ones, like cryptocurrency. It is naive to believe that buyers and sellers will suddenly forget about plastic cards, which have a strong presence in the market and don’t go away anytime soon. Thus, Graft combines both methods and makes the payment process simple and available in any situation. The buyer can pay with their cryptocurrencies directly wherever it’s possible, but use the plastic card, which is linked to the wallet, in any other place that is not yet familiar with crypto. The same is with the seller. Using single point of sale app, merchant can accept various crypto-currencies and credit/debit cards. In addition to these main goals, we are designing more services that will be provided by GRAFT network to improve the lives of sellers and buyers. For example, obtaining an instant credit by the buyer, or creating merchant tokens, which will be used by sellers as “private cryptocurrency” for important business functions such as store credits, loyalty rewards, gift certificates, and discount coupons. There is another interesting and promising feature, which is in conjunction with merchant tokens elevates Graft from “another payment network” to a universal payment platform. This feature is called vchain, from the combination of words “virtual”, “chain”, and “blockchain”. Using vchain, sellers can connect several points of sale located in one store, or even create a network (“chain”) with multiple stores. Buyers can also use vchain to manage multiple wallets linked to each other and transfer funds for free between multiple accounts, which is useful for family or corporate accounts. And finally, a few words about security and privacy. GRAFT uses the CryptoNote protocol, which is by far the highest achievement of modern cryptography. CryptoNote provides incomparably better privacy features comparing to any other blockchain protocol. Payments recorded on the GRAFT blockchain can not be viewed, traced, or linked to particular identity without consent. CryptoNote completely conceals from prying eyes almost all the attributes of the transaction: the buyer’s address, the amount of payment, and the address of the seller. On top of that, GRAFT adds another feature that is unique and has not yet been implemented by anyone else: hidden transaction fee amount. Thus, serious buyers and sellers, who really care about privacy of their financial transactions, for the first time have an opportunity to make their payments in cryptocurrency or cards without the risk of spying from competitors, criminals, or just random observers. We have always believed in staying transparent and engaged with our contributors and supporters community. We have reached a decision that we would like to extend the pre-sale to give ourselves a better chance at collecting sufficient funds for live network development and tokenswap/ICO marketing. We are extending the pre-sale until we reach the sale of 135,000 grf tokens or until October 15, 2017 (one month from the start), whichever comes first. Finally, we are adding XMR (Monero) as one of the currencies we accept in order to appeal to the Monero / CryptoNote community since we’re based off the same protocol and are looking to allow merge mining. We understand that our integrity and transparency means a lot to the community and we take any changes we make very seriously. We hope you will see these changes as positive and beneficial to the project’s overall success. Best regards and thanks for all of your support! 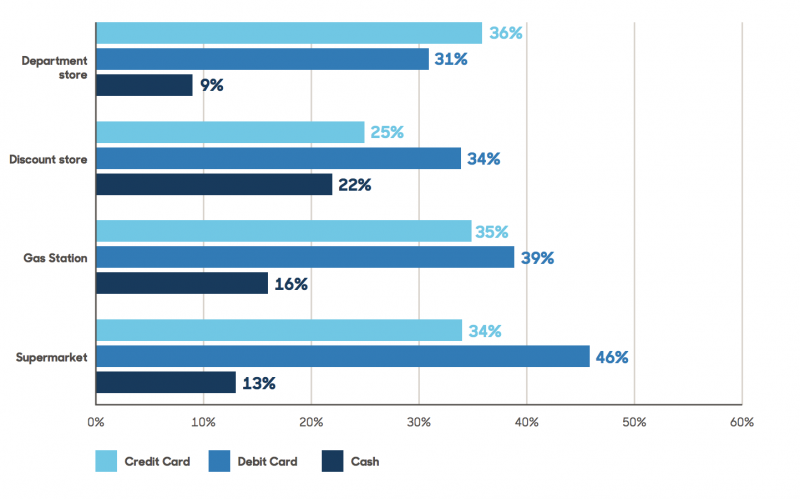 According to 2016 US Payments study published by TSYS, there’s a distribution of what methods people prefer to use when paying for things: In fact, they tend to use different payment methods in different situations: To understand what people use and under what circumstances, you’d have to consider the pros and cons that each method provides. Cash for example is very easy to use, it’s accepted everywhere (even if power is out), but it’s subject to theft; debit cards on the other hand provide the convenience of not having to carry cash around and don’t allow people to spend more than they have, but they also don’t provide the fraud protection and require the terminal to be processed; credit cards are great, but allow you to spend too much and carry high interest rates. 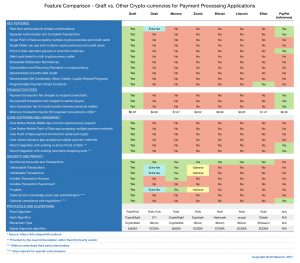 So we’ve decided to compare all these methods, including Bitcoin, against GRAFT. 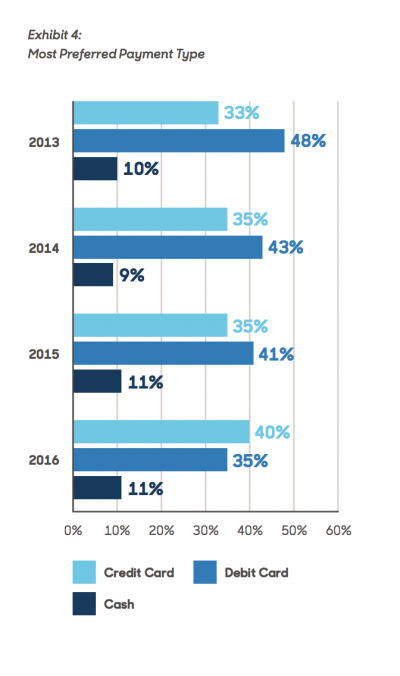 Here’s what it comes down to: Payment preferences change quickly and are different geographically and demographically, but based on this comparison, we think we’re on the right track! It is not a secret that some payment functions cannot be fully decentralized, even if they are “placed” on top of blockchain technology. One example is credit card payment processing which implies a lot of compliance with various regulations, both local and international. But we still want to use those cards, and we would like them to work together with cryptocurrencies. GRAFT Network resolves this dilemma by introducing service brokers which implement specific features that cannot be fully automated by decentralized network. This short article explains how service broker work in a form of instructions for a newbie. Any existing company-service provider (such as credit card payment processor or cryptocurrency exchange) can become a GRAFT service broker, and thus magically extend their business from “traditional” centralized world to the world of decentralized crypto payments. Install your own full supernode or make a lease agreement with one or more full supernode owners. 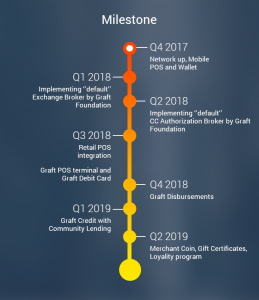 GRAFT Network will broadcast the advertisement messages to all supernodes and make it available to all wallet and/or point of sale clients connected to the network and matching the target audience criteria, along with your reputation score calculated by full supernodes based on historic data stored in the blockchain. Share service fees with the processing supernode owner if you “lease” the supernode, or earn extra fees if you own the supernode. 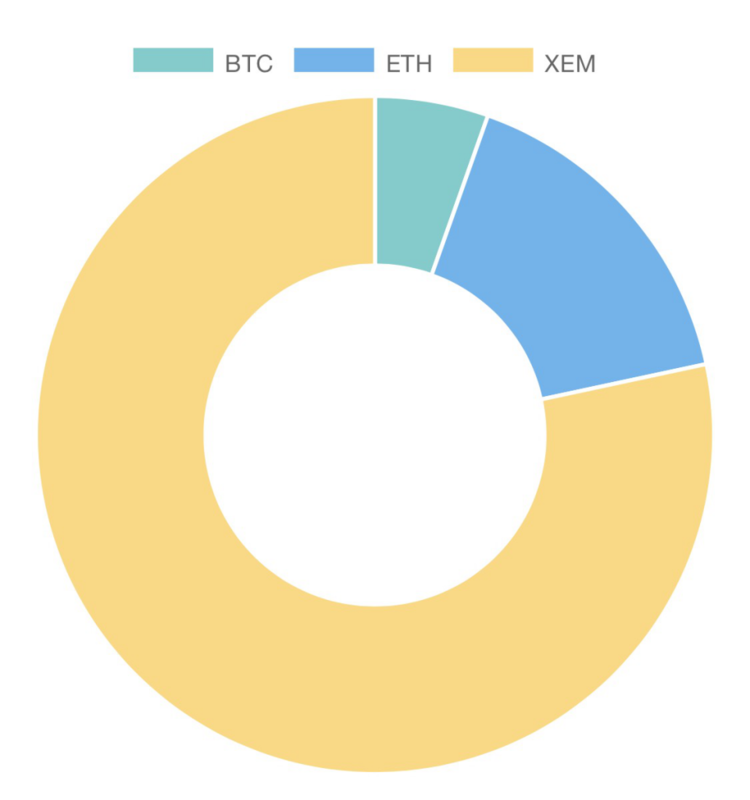 NEM Community is the biggest contributor so far to the ongoing GRAFT Network Token Pre-Sale! It looks like all the bitcoins were sold out last week during the fall… Don’t forget that GRAFT Wallet and Point of Sale apps support BTC and ETH too! Dear Graft Network Supporters, the time has come! The GRAFT token Pre-SALE is now open. Not only is it 30% off the ICO price, but because the pricing was set when Bitcoin and other cryptocurrencies were at their peak and we decided not to re-price it after the dip, the effective discount is closer to 50%! For details please see https://www.graft.network/pre-ico/ Thank You! GRAFT Team.